OBJECTIVE To document efforts on the part of public officials in California to soften the media campaign’s attack on the tobacco industry and to analyse strategies to counter those efforts on the part of tobacco control advocates. METHODS Data were gathered from interviews with programme participants, direct observation, written materials, and media stories. In addition, internal documents were released by the state’s Department of Health Services in response to requests made under the California Public Records Act by Americans for Nonsmokers’ Rights. Finally, a draft of the paper was circulated to 11 key players for their comments. RESULTS In 1988 California voters enacted Proposition 99, an initiative that raised the tobacco tax by $0.25 and allocated 20% of the revenues to anti-tobacco education. A media campaign, which was part of the education programme, directly attacked the tobacco industry, exposing the media campaign to politically based efforts to shut it down or soften it. Through use of outsider strategies such as advertising, press conferences, and public meetings, programme advocates were able to counter the efforts to soften the campaign. CONCLUSION Anti-tobacco media campaigns that expose industry manipulation are a key component of an effective tobacco control programme. The effectiveness of these campaigns, however, makes them a target for elimination by the tobacco industry. The experience from California demonstrates the need for continuing, aggressive intervention by non-governmental organisations in order to maintain the quality of anti-tobacco media campaigns. The California Department of Health Services (DHS), one of the agencies charged with programme implementation under AB75, envisioned delivering an aggressive anti-tobacco programme that combined statewide media with local community-based activities.4 5 Under Governor George Deukmejian (Republican), DHS moved quickly to implement the media campaign. The Request for Proposals was released on 1 December 1989, 59 days after Deukmejian signed the appropriations bill, with responses from advertising agencies due on 10 January 1990. The advertising agency keye/donna/perlstein was selected to run the media campaign on 26 January,6 and the first advertisements were released 73 days later, on 10 April 1990,7 accompanied by a full-page newspaper advertisement on 11 April 1990 (figure 1 and box). First, the smoke. Now, the mirrors. In less than a generation, the bad news about cigarettes has become no news. Most Americans—even the very young—know the unavoidable connection between smoking and cancer, smoking and heart disease, smoking and emphysema and strokes. Today a surprising number of us can tell you that cigarettes are our #1 preventable cause of death and disability. So, we seem to know about the smoke. But what about the really dangerous stuff—all those carefully polished, fatal illusions the tobacco industry has crafted to mess with our minds so they can mess with our lives? That’s one hell of a message. How can you fight it? Today, the California Department of Health Services begins a fifteen month advertising campaign that goes right at the tobacco companies’ predatory marketing—the selective exploitation of minorities, the seduction of the young, the selling of suicide. Well, won’t the tobacco industry fight this campaign? On the contrary, we intend to make you more aware of the tobacco industry’s advertising. And, if we pinch the right nerve, we expect them to make you more aware of ours. This is going to be a media campaign about a media campaign—as much about hype as hygiene. It’s going to talk about a shared community opportunity and a shared community menace. There’s never been anything quite like it. But this is California. We don’t need to do it the way it was done before. 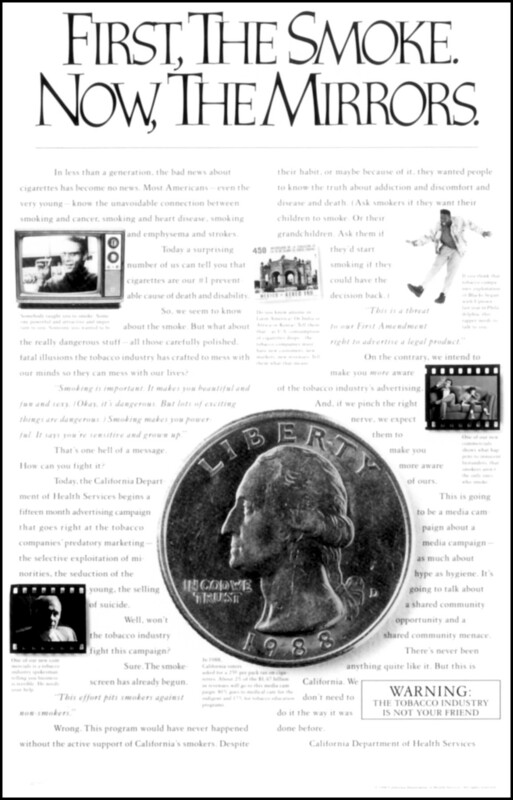 Figure 1 A copy of the full-page advertisement that ran in newspapers to mark the advent of the media campaign, along with a reproduction of the text from the ad. 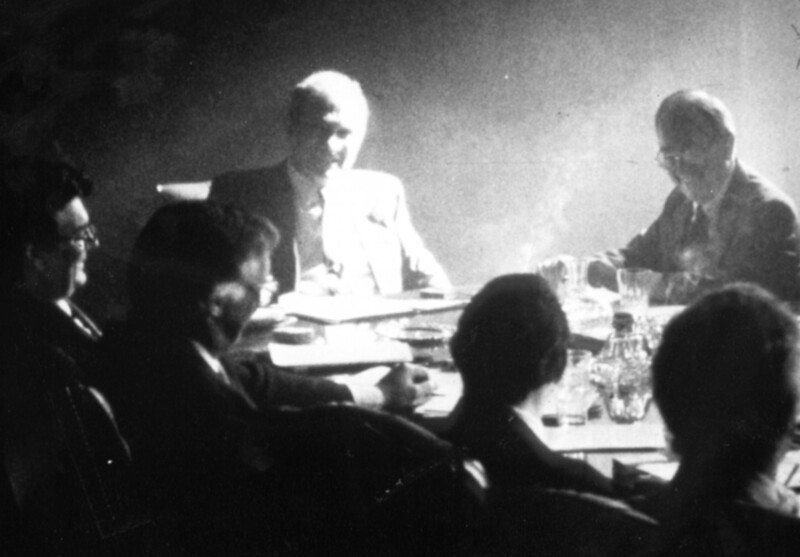 The first advertisement in the California campaign, “Industry Spokesman,” depicted a group of tobacco industry executives sitting around a boardroom joking about recruiting new smokers. Despite being the advertisement with the highest recall in the California programme, the Wilson administration refused to air it. Since its inception, the media campaign has remained the source of controversy, with California tobacco control advocates working to maintain an aggressive tone and the tobacco industry and its allies seeking to soften the tone and limit the scope of the campaign. These issues marked the debate over the media campaign in 1996–1997. As this paper will document, while health groups succeeded in stopping the explicit legislative restrictions against attacking the tobacco industry that the pro-tobacco forces tried to include in the Budget Act, decisions and processes by the administration of Governor Pete Wilson, who had succeeded Deukmejian, tried to achieve the same goals. Eventually, by mounting outside pressure on the administration, public health groups were able to push the media campaign back towards its original posture. The experience from California demonstrates the need for continuing, aggressive intervention by non-governmental organisations to maintain the quality of anti-tobacco media campaigns. The information used to prepare this report was gathered from interviews with the participants, direct observation, written correspondence, and media stories. Where media stories have been based on California Public Records Act requests, we have also obtained the documentation on which the storied were based to verify the accuracy of the reported information. In addition, internal documents about the 1996–1997 media campaign were released by the Department of Health Services in response to requests made under the California Public Records Act by Americans for Nonsmokers’ Rights. These materials document the internal response to the events occurring outside of the Department. Finally, a draft of the paper was circulated to 11 observers of the 1996–1997 conflict for their comments. The flexibility the media campaign enjoyed under Deukmejian dissipated with the inauguration of Pete Wilson (R) as governor in January, 1991. Deukmejian had taken a “hands off” policy with regard to the development and production of the advertisements, leaving the control of the campaign in the hands of the professionals in the Department of Health Services.14 15 According to Kizer, once Wilson became governor, there were comments from Wilson’s office that they wanted the subsequent advertisements toned down and wanted to review them.15 Wilson eventually attempted to shut the media campaign down completely and, failing that, imposed increasingly tight political control over it. 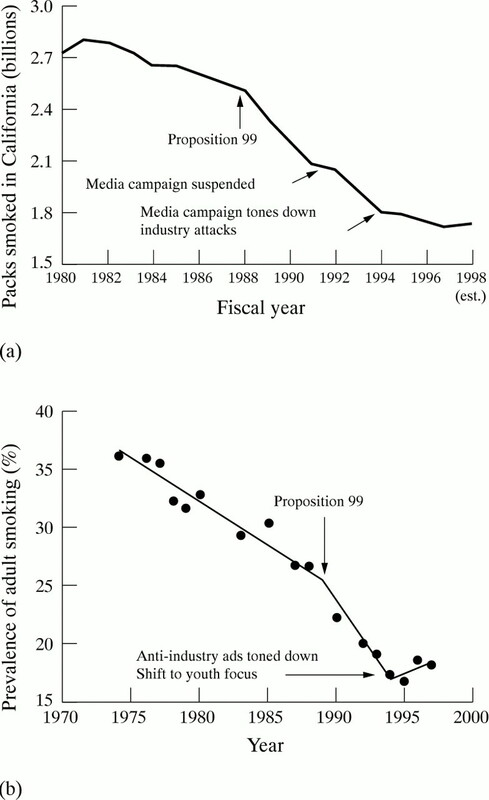 Long-term patterns of cigarette consumption in California show that when the media (and other aspects of the tobacco control programme) were suspended or weakened, the progress in reducing cigarette use was arrested. In the fiscal years, 1994–95 and 1995–96, the legislature continued to allocate money—nearly $12 million annually—to the media campaign. The allocation of money, however, did not ensure that a quality programme would result or even that the money would necessarily be spent. There was little new anti-tobacco advertising produced during that period, and none at all between September 1995 and 20 March 1997. In 1995–1996, the Wilson administration only spent $6.5 million of the $12.2 million the legislature appropriated for the media campaign. This weakening of the media campaign, in content and intensity, was associated with a lessening of the effect of the overall anti-tobacco programme on tobacco consumption and an increase in adult smoking prevalence11 (figure 3). 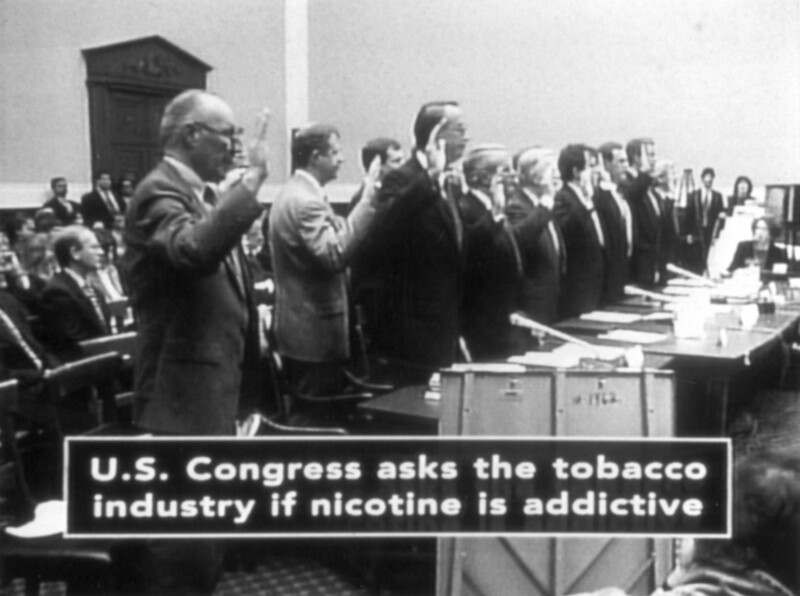 The “Nicotine Soundbites” advertisement was based on the Congressional hearings at which tobacco executives denied that nicotine was addictive. The Wilson administration pulled the advertisement after the tobacco industry complained, and kept it off the air, despite repeated demands by public health advocates that it be put back on the air. Smoley, a registered nurse, did not approve of accusing the tobacco industry of lying. Following litigation and political action by programme advocates,2 40 in June 1996, the legislature provided full funding for the Proposition 99 education and research programmes for the first time since Proposition 99 passed, including $25 million for media. Although he acquiesced in the decision to provide full funding, Assembly Speaker Curtis Pringle (R–Garden Grove) attempted to include language in the budget to prohibit the media account from being used to attack the tobacco industry. His proposed bill language specified that advertisements “be based solely on the health implications of tobacco use and on the health implications of refraining from tobacco use.”41 Such messages, stressing health effects of smoking, are not particularly effective at preventing young people from smoking or motivating adults to stop.11 42 Pringle’s justification was that taxpayer dollars should not be used to attack a legal industry,41 a position similar to that taken by Smoley. Pringle’s language putting limits on the media account was eventually dropped because of opposition from key Democrats who were involved in the final budget negotiations. The successful defeat of legislative language to restrict the media account, however, did not mean that public health professionals would be allowed to run the media campaign without political interference. As the year unfolded, it became clear that the Wilson administration was restricting the media account quietly and behind the scenes without legislation. Before the budget even passed, those inside the administration were already implementing restrictions similar to those Pringle had proposed. At the time the 1996–1997 budget was signed, the contract to administer the media account was held by the advertising agency Asher/Gould, which had been awarded the contract in May 1994. When the new budget passed in 1996, the Department of Health Services extended Asher/Gould’s contract for producing media through 31 December 1996 and issued a new Request for Proposals (RFP) for the media campaign for the period from 1 January 1997 through 31 December 1999. The new RFP was not necessary because the existing contract with Asher/Gould had an option by which the state could have extended it through June 1998 without going through the lengthy process of rebidding the contract. Based on the past successes of the campaign, several of these proposed advertisements featured attacks on the tobacco industry. One of these advertisements was “Cattle”, which showed cowboys rounding up children as a metaphor for the tobacco industry hooking kids on cigarettes. “Cattle” began with the words: “This is how the Tobacco Industry wants you to see them . . .”, and was originally to feature a kid being lassoed by one of the cowboys and dragged to where another cowboy was waiting with a brand reading, “Tobacco Industry”. The brand was to be photographed moving towards the camera, which represented the child’s point of view. The final line was: “The Tobacco Industry. If you knew what they thought of you, you’d think twice.” Another advertisement: “Thank you”, a television advertisement that eventually became a radio spot, was a sarcastic “thank you” letter from the tobacco industry to kids in appreciation for their loyalty despite overwhelming evidence that tobacco kills. It began with the line: “The Tobacco Industry would like to thank . . .” and ended with the line: “Sincerely, the Tobacco Industry”. Three billboards were also presented, two of which are shown in figure 5. Two billboards produced in March 1997. These billboards were submitted to the Department of Health Services by the advertising agency in June 1996. During the intervening nine months, there was a tug-of-war between administration officials, who watered down the advertisements, and public health advocates, who wanted the advertisements strengthened. The nine-month review process resulted in no changes in these billboards. In July 1996, Mike Genest, assistant deputy director for prevention services at DHS, who was widely viewed as representing the governor’s interests in the department, was concerned that everything that Asher/Gould had presented for young people was controversial and would need to be approved several layers up the chain of command. He questioned the efficacy of the approach of attacking the tobacco industry, prompting Bruce Silverman, president of Asher/Gould, to write to Dileep Bal, Chief of the Cancer Control Branch (which includes TCS), that: “The only effective method I know of to achieve that [reduction in tobacco use] via advertising is with the “Manipulation” strategy that we just tested”.48 In addition to general concerns about attacking the industry, Genest wanted the words: “Tobacco Industry” changed to “Big Tobacco”.49 Nothing was approved to go into production. It would take nearly nine months for these advertisements to appear, with minor changes from the original proposals. During this time, the ads would be watered down, then re-strengthened. In addition to slowing the approval process, the Wilson administration made other changes designed to tone down and slow down the media campaign. Prior policy had been that once an anti-tobacco advertisement was approved, it was up to TCS and the media contractor’s professional judgement when to run a given advertisement. In August 1996, when Asher/Gould suggested running “Industry Spokesman” again because it had not been aired for several years, Genest announced a new policy that every advertisement, even those previously approved, be cleared for each use.50 Bal described this new policy as “a fundamental change that I for one was unaware of until now.”51 Between the delay over the new media and the need for re-approval of the old, there was clearly no intention of getting the media campaign up and running in a hurry. There were other steps taken inside the administration to impose tighter political controls on the media campaign. On 16 September 1996, the DHS Office of Public Affairs (OPA) released a memo requiring that all advertising concepts be reviewed by OPA before being focus group tested or shared with “stakeholders/interested parties”.52 In other words, an official charged with protecting the administration’s political and public relations positions would review proposed advertisements for political acceptability before any formal evaluation of the advertisements for quality or effectiveness as public health messages could take place. Bal’s offer to open up discussion of the basic campaign strategy to include the public health community flew in the face of the general approach taken by DHS in the fall of 1996. During the first years of the California anti-tobacco media campaign, DHS and the advertising agency had actively involved members of the public health community in the development of the advertising campaign.5 Recognising that efforts to slow down and weaken the media campaign would spark controversy within the public health community, the administration shut the public health community out of the review process. In the initial stages of the campaign, DHS had involved a broad cross-section of the public health community in the process of developing new media through a large, somewhat informal media advisory committee. This committee stopped being convened, and the administration even quit involving TEROC in the review of the story boards. Another proposed new advertisement, “Voicebox”, did attack the industry as it was proposed. It featured a woman smoking through a tracheotomy, stating that the tobacco industry had lied to her about the addictive nature of its products. In December, the industry attack was deleted, and the advertisement instead promoted the state’s toll-free (freephone) quit line. In the revised December version neither addiction nor the tobacco industry is mentioned by name. The advertisement instead featured a smoker who could not quit despite having a tracheotomy, urging others to give quitting a try. An anti-industry advertisement had been converted into a cessation spot that said that quitting was impossible—a strange message from a public health department. On 4 February 1997, the presidents of the American Cancer Society (ACS), American Heart Association (AHA), and Americans for Nonsmokers’ Rights (ANR) wrote to Smoley to express their frustration with the “administration’s ostensible defense of an industry responsible for the deaths of more than 42 000 Californians each year—the tobacco industry”. The three organisations protested the long delay in the production of new media and urged Smoley to release a campaign that featured the original campaign themes: “the tobacco industry lies”, “nicotine is addictive”, and “secondhand smoke kills”. Meanwhile, John Miller, chief of staff to Senator Diane Watson (D–Los Angeles), chair of the state Senate Health Committee, was threatening to hold hearings on the conduct of the media campaign. Cook called an emergency meeting of TEROC for Monday, 10 February 1997, to follow up on Stratton’s refusal to share information about the media campaign with TEROC and to decide what action TEROC should take in response. On the Friday before the emergency TEROC meeting, Stratton announced a major shakeup of TEROC. Three physicians on TEROC who had been strong advocates for the anti-tobacco education campaign, were replaced with individuals closely allied with the Wilson administration. Lester Breslow, former dean of the UCLA School of Public Health and former director of DHS, who had been on TEROC since its formation in 1990, and Reed Tuckson, president of Drew University of Medicine and Science in Los Angeles, were told that they had been replaced in an action allegedly taken three months earlier by Assembly Speaker Pringle (R), the day before the Democrats took over the Assembly. Neither Pringle nor DHS had given any indication of these changes before 7 February, even though TEROC had met in December, after the date that Pringle supposedly made the appointments. Jennie Cook, TEROC chair, had been unaware of them. Spokesmen for Pringle and the Governor said that either DHS was not informed or the appointment letters had been lost.62 In the physicians’ places, Pringle appointed Hal Massey, a retired Rockwell executive who had been active in ACS, and Doug Cavanaugh, the president of Ruby’s Restaurants, who was, according to Pringle, “familiar with the tobacco debate, balancing regulations with people’s right to smoke”.62 DHS also announced that Governor Wilson had replaced Dr Paul Torrens of the UCLA School of Public Health with Dr George Rutherford, who had been the state health officer in the Wilson administration and responsible for the Proposition 99 programme until he left to join the faculty at the University of California. Wilson also appointed Stratton to TEROC, making him a member of his own oversight committee. On Monday morning, before the TEROC meeting scheduled for that afternoon, ACS, AHA, ANR, and the American Lung Association (ALA) called a press conference to protest the changes in the TEROC membership and to express their concerns about the administration of the programme. Alan Henderson, president-elect of ACS, Carolyn Martin, a volunteer with ALA and former chair of TEROC, John Schaffer, of AHA, and Stanton Glantz, of the University of California at San Francisco, spoke at the press conference. They pointed out that it was inappropriate for Stratton to sit on TEROC, because he had asserted direct responsibility for the day-to-day management of the DHS tobacco programme, particularly the media campaign, setting up a potential conflict of interest. Indeed, Stratton, at the meeting on 10 December, had claimed responsibility for putting in place the secrecy policies that had led to the TEROC emergency meeting in the first place. In February 1997, DHS responded to the pressure about the advertisements by again revising them, although this fact was not made public at the time. For example, Frost approved putting “The tobacco industry” back into the “Cattle” advertisement, changing: “If you knew what they thought of you, you’d think twice” to: “The Tobacco Industry. If you knew what they . . .”. In “Rain”, the voice over at the end was changed to: “The tobacco industry. How low will they go to make a profit?” In addition, “Thank you”, which had become a radio spot, had the words “Tobacco Industry” added back in, both in the opening sentence and in the last line. TEROC was finally shown the new advertisements at its meeting on 25 March, after they were released to the public, and Cook indicated that their reactions were mixed.69 Only the version of “Voicebox” that emphasised addiction and the industry was shown. The advertisements as released, nine months after Asher/Gould originally proposed them, were similar to those originally proposed by the advertising agency. At the TEROC meeting on 25 March, John Pierce, director of the California Tobacco Survey, presented the latest California smoking prevalence data, which showed that smoking rates for young people and adults appeared to be going up. Overall, youth smoking, which had been as low as 8.7% in 1992, rose to 11.9% in 1995 and remained flat in 1996 at 11.6%. The annual Behavioral Risk Factors Survey conducted in-house at DHS showed that adult smoking prevalence had increased from 16.7% to 18.6% from 1995 to 1996,72 reversing a downward trend that had existed for nearly a decade.10 73 The increase in smoking rates received wide media coverage.73-75 Public health groups blamed the increase on the fact that the administration had not fully funded Proposition 99’s anti-tobacco education programmes and on its reluctance to attack the tobacco industry. Sean Walsh, the Governor’s press secretary, commented that he was frustrated with Wilson being blamed for everything “including [the comet] Hale-Bopp”.73 He referred to criticisms by the public health groups as “Chicken Little-like comments made by zealots in the anti-smoking community”.75 The actions by the public health groups, however, far from reflecting “Chicken Little” zealotry, did call attention to and partially block the administration’s attempt to run a poor quality tobacco control programme. Since 27 March 1997, the policies of secrecy and the cumbersome approval process surrounding the media campaign have remained in place. On 15 April 1997, ACS, AHA, and ANR wrote to Governor Wilson, asking him to intervene personally to get the programme back on track. They specifically requested that he allow “Nicotine Soundbites” and “Insurance” to the air and that he actively support the implementation of Assembly Bill 13 (AB13), California’s law mandating smoke-free workplaces. The governor’s deputy chief of staff wrote back on 16 May 1997, saying that Belshe and Smoley “forthrightly” represented the governor’s position.70 Public health professionals within TCS still do not control the content of the advertisements. Smoley took several actions to prevent the media campaign from interfering with the tobacco industry’s efforts to overturn smoking restrictions in California. In 1994, Smoley prohibited use of the advertising campaign to publicise AB13,77 because Philip Morris was mounting an initiative campaign, Proposition 188,78 to overturn California’s workplace smoking restrictions. Even after Proposition 188 was defeated, however, there was still no advertising to educate the public that virtually all workers had a right to a smoke-free workplace. In 1997, Smoley delayed advertisements to implement California’s smoke-free bar law (which went into effect on 1 January 1998) for several months. Those advertisements, first proposed in May 1997, were not approved until October, because Smoley did not want advertisements on the air promoting the smoke-free bar law while the tobacco industry was attempting to get the law overturned in the legislature. In late November 1997, DHS began running two advertisements promoting smoke-free bars—one on the radio and one on television. Anti-tobacco media campaigns are key components of effective tobacco control programmes.4 With adequate funding, it is possible for tobacco control professionals to pursue a sophisticated marketing strategy that includes market segmentation and research on the effectiveness of anti-smoking messages.11 79 These advertisements can then be professionally produced and aired in prime television and radio times, providing “air cover” for other tobacco control efforts, such as community-based programmes or policy interventions. Effective advertisements must personify and expose industry manipulation, but the experience of California and other states demonstrates that these advertisements are precisely the ones that the industry will work the hardest to stop. Given the importance of media to tobacco education programmes, tobacco control advocates must be aware of the industry’s efforts to place controls on anti-tobacco media campaigns, and be willing to take strong actions to see that executive branch officials charged with implementing the campaign do not succumb to this pressure. The California experience also illustrates the key role that programme advocates in non-governmental organisations can play in protecting media campaigns. The public health professionals who work in government agencies will be subject to the limits set by their politically appointed superiors. Thus, advocates outside of government must carefully monitor the quality and scope of government funded media campaigns and be ready to pressure these agencies to run effective advertisements. Public health interventions that are opposed by the tobacco industry will survive only through the continuing advocacy efforts of the public health community. It is clear, however, that the public health groups have been effective in forcing the Wilson administration to run a more aggressive campaign than it wanted. Their repeated requests to be involved in the review process were denied, although by the end of the year the pressure they brought on the programme from the outside, combined with the threat of a legislative hearing, appeared to have had a positive effect on the quality of the media campaign. Through use of paid and free media to call attention to the administration’s behaviour, public health advocates succeeded in forcing the administration to strengthen the advertisements to reflect good public health practice. The use of these kinds of outsider strategies are essential in protecting public health programmes from powerful insiders, like the tobacco industry. Outsider strategies are typically used by non-governmental organisations who have popular support and fewer resources, such as campaign contributions, for lobbying elected officials. Among the key outsider strategies that have been used successfully by advocates in California have been using the public forum provided by TEROC, creating print advertisements to call attention to programme problems, taking advantage of free media, and monitoring internal departmental activities through use of the public records act. TEROC was established legislatively to provide oversight for the tobacco education and research programmes funded by Proposition 99. By having programme advocates among its members and, importantly, having one as its chair, TEROC has been able to question publicly the conduct of the programme. As its meetings are open to the public, it also creates a venue for members of the press to follow programme controversies. For public health advocates, the existence of oversight bodies for public programmes can create an opportunity for putting public accountability into public health programmes. When such bodies are created by legislation or by administrative action, their responsibilities, powers, and membership are potentially important for the conduct of the programme and should be treated as such by programme lobbyists. It is important who is eligible for membership, who makes appointments to the body, and what responsibilities the body is given. The media—both paid advertising and free media—are important vehicles for putting pressure on public agencies. By running their own advertisements, programme advocates can create a forum in which they are able to frame issues publicly in a way that reflects their viewpoint. This is a particularly powerful strategy if other forums, such as legislatures or oversight bodies, have not been responsive. Such advertisements reach decision makers, the public, and reporters, and call attention to the fact that there are problems with the programme. This may also be an important avenue to obtaining free media in the form of news coverage. According to Steve Scott, managing editor of the California Journal, “ A lot of times what we look at as journalists to sort of guide us in determining what’s a real issue and what’s not a real issue is the attitude of the constituent groups. . . . [T]he assumption was that if nobody’s making any noise about this then it’s just not that big a deal.”82 By taking an action as public as running an advertisement, public health groups can alert the media to an interesting story and thus provide heightened monitoring of programme implementation. In recent years, the tobacco industry has been using public records acts to try to impede agency functioning and to discredit agency programmes.83 Public records acts, however, can also be used by programme advocates to monitor how programme monies are being spent and the ways in which political appointees may be impeding the work of public health professionals. If information on programme implementation is not freely shared with programme advocates, then it may be necessary for them to force such information into the public domain. The challenge for the public health community is maintaining this level of outsider pressure over long periods of time, because the industry will continue its pressure on the inside to protect its interests. As more states embark on anti-tobacco advertising campaigns, either due to state and local initiatives or due to settlements of industry lawsuits, public health advocates need to understand the importance of helping to establish the rules by which this money will be spent and monitoring the process of spending it. Public health groups can help campaigns if they are allowed to be involved; if they are not, however, they can still protect the quality of the programme through outsider, advocacy strategies designed to hold public agencies accountable for mounting high-quality campaigns. This work was supported by the National Cancer Institute (Grant CA-61021). (1996) California’s tobacco tax initiative: the development and passage of Proposition 99. J Health Policy Politics Law 21:543–585. Glantz SA, Balbach ED. California tobacco wars. Berkeley, California: University of California Press. (In press.). (1997) Smoking out tobacco’s influence. California Journal, Apr:14–18..
State of California Department of Health Services, Tobacco Control Section. National Cancer Institute planning model.California Department of Health Services, December 1989..
(1990) Reducing tobacco consumption in California: development of a statewide anti-tobacco use campaign. JAMA 264:1570–1574. (1990) Keye/Donna to do anti-smoking ads for state. Los Angeles Times, Jan 27:D2..
Scorching attack on cigarette firms. Los Angeles Times 1990 Apr 10:1A..
Keye P. What don’t we know, and when haven’t we known it? Speech given at Johns Hopkins University, 13 October 1993..
(1993) Changes in cigarette consumption, prices, and tobacco industry revenues associated with California’s Proposition 99. Tobacco Control 2:311–314. Tobacco Education and Research Oversight Committee. Toward a tobacco-free California: renewing the commitment 1997–2000. Sacramento, California: State of California Department of Health Services, 31 July 1997..
(1998) Evaluation of antismoking advertising campaigns. JAMA 279:772–777. (1990) Anti-smoke torch flickers. Advertising Age, Apr 16:1..
(18 April 1990) Memorandum to Samuel D Chilcote, Jr. (The Tobacco Institute). (1990) Deukmejian cool to blitz on smoking. San Francisco Chronicle, Apr 11:1..
(1998) Bid to dilute anti-smoking effort revealed. Los Angeles Times, Jan 2..
(1992) Governor’s budget 1992–1993. (Office of the Governor, January, Sacramento, California). (1992) Demos assail Wilson plan to cut funds for anti-smoking drive. San Francisco Chronicle, Jan 23:A15..
(1992) Wilson’s plan to shift funds disguises tax hike, critics say. Sacramento (California) Bee, Jan 26:A3..
(1992) Anti-smoking program big hit—but governor seeks to cut it. San Francisco Chronicle, Jan 15:14..
(23 January 1992) California governor wants to extinguish anti-tobacco ads. (Associated Press). Pierce JP. Evaluating Proposition 99 in California. American Heart Association, Nineteenth Science Writers Forum, 12–15 January 1992..
(1992) California push to cut smoking seen as success. Wall Street Journal, Jan 15:B1..
State set to scrap anti-smoking TV ads. Los Angeles Times 1992 Jan 16:B8..
State study lauds anti-smoking drive. San Francisco Examiner 1992 Jan 25:A5..
Duerr J. Memo to Dileep Bal. Sacramento, California: State of California Department of Health Services, 29 January 1992..
(1996) Officials: Wilson undercut TV ads on smoking. San Francisco Examiner, Dec 22:A1..
American Cancer Society. Memo to unit executive directors from Ron Hagen. California: American Cancer Society, 23 January 1992..
Americans for Nonsmokers’ Rights. Prop 99 $$ slashed: media campaign killed already! Americans for Nonsmokers’ Rights, 22 January 1992..
(1992) Court orders California governor to restore antismoking media campaign funding. JAMA 267:2721–2723. (1992) American Heart Association seeks to delay state health department director’s confirmation. JAMA 267:2723–2726. Hite B. State of California Department of Health Services signs contract for tobacco education media campaign. Sacramento, California: State of California Department of Health Services, 11 June 1992..
Johnston JW. Letter to Belshe. R J Reynolds Tobacco Company, 13 October 1994..
Belshe SK. Letter to Martin G Glick. Sacramento, California: State of California Department of Health Services, 12 October 1994..
Stevens C. Email to Dileep Bal. Sacramento, California: State of California Department of Health Services, 1 February 1995..
(1995) State accused of shelving anti-smoking ad. San Diego Union-Tribune, Dec 13:A3..
(1995) Groups accuse Wilson of blocking anti-tobacco ad. 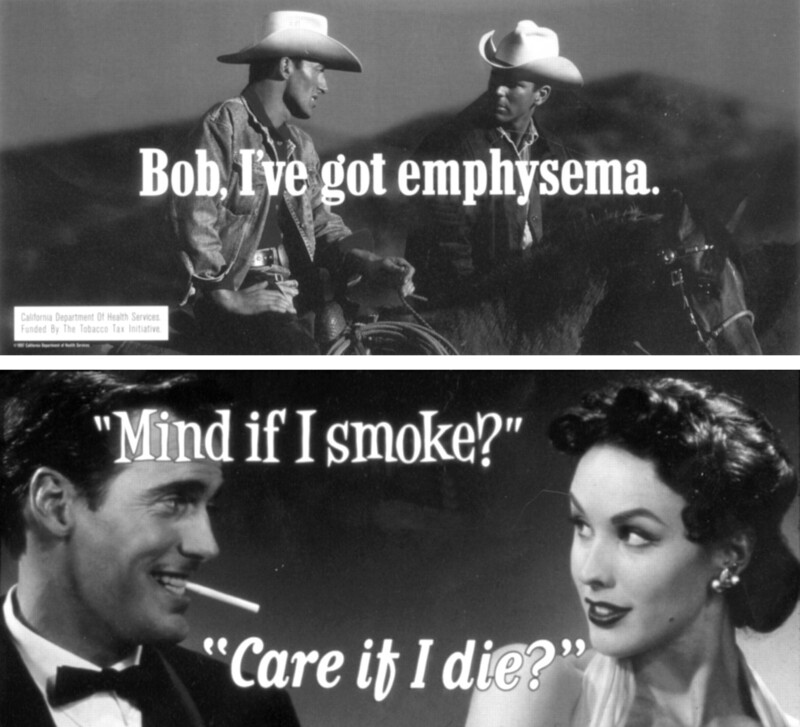 Sacramento (California) Bee, Dec 14:B4..
(1995) Furor over anti-smoking TV ad. San Francisco Chronicle, Dec 23:A23..
Belshe SK. Letters to Mary Adams, Alan Henderson, and Tony Najara [sic]. Sacramento, California: State of California Department of Health Services, 8 February 1996..
Smoley SR. Letter to Bailey, Pertschuk, and Fung. Health and Welfare Agency, State of California, 7 March 1997..
Balbach ED, Monardi FM, Fox BJ, et al. Holding government accountable: tobacco policy making in California, 1995–1997. Institute for Health Policy Studies, University of California, San Francisco, June 1997..
(1996) Pringle targets anti-tobacco research, ads. Los Angeles Times, Jun 27:A3..
Steele C. Letter to Colleen Stevens. Asher/Gould Advertising, 4 December 1996..
State nixed anti-tobacco TV ads in ‘95. Contra Costa Times 1996 Aug 12.. The speaker’s smoke machine. Sacramento (California) Bee 1996 Jun 28:B6..
Belshe SK. Memorandum to Sandra R Smoley. Sacramento, California: State of California Department of Health Services, June 1996?. Lyman DO. Memo to James W Stratton. Sacramento, California: State of California Department of Health Services, 25 September 1996..
Contract extension creative development timeline. [Sacramento, California: State of California Department of Health Services], June 13 1996..
Silverman BG. Letter to Dileep G. Bal. Asher/Gould Advertising, 2 July 1996..
Shimizu R. Email to Colleen Stevens. Sacramento, California: State of California Department of Health Services, 5 July 1996..
Genest M. Email to Dileep Bal. Sacramento, California: State of California Department of Health Services, 23 August 1996..
Bal D. Email to Mike Genest. Sacramento, California: State of California Department of Health Services, 21 August 1996..
Munso J. Memo to all deputy directors. State of California, 16 September 1996..
Shimizu R. Email to Dileep Bal. Sacramento, California: State of California Department of Health Services, 10 October 1996..
Bal D. Email to Don Lyman. Sacramento, California: State of California Department of Health Services, 10 October 1996..
Bal D. Email to Don Lyman. Sacramento, California: State of California Department of Health Services, 11 October 1996..
Cook JR. Letter to Stratton. Tobacco Education and Research Oversight Committee, 31 December 1996..
Tobacco Education and Research Oversight Committee.Minutes. Sacramento, California: State of California Department of Health Services, Tobacco Control Section, 10 February 1997..
State of California, State of California Department of Health Services. Standard agreement with Asher/Gould Advertising.State of California, 1 December 1996..
Stevens C. Memo to Nikki. State of California Tobacco Control Section, March? 1997..
Shimizu R. Email to J Howard and D Bal. Sacramento, California: State of California Department of Health Services, 27 January 1997..
Friedman M. Teen anti-smoking strategy focus groups. Summary report. Prepared for State of California Department of Health Services, Tobacco Control Section & Asher/Gould Advertising, November 1996..
(1997) Controversy flares over state’s anti-tobacco efforts. Los Angeles Times, p A3. Health groups rap Wilson. Oakland (California) Tribune 1997 Feb 11..
Health groups say governor too soft on tobacco. San Jose Mercury News 1997 Feb 11.. Anti-smoking groups demand state get tougher. Modesto (California) Bee 1997 Feb 11..
(1997) Health groups: anti-smoking ads stifled? Sacramento (California) Bee, Feb 11..
(1997) Governor chided for policies on tobacco. Contra Costa Times, Feb 11..
(1997) Wilson Administration hit for hiding anti-smoking ads. San Francisco Chronicle, Feb 11:A18..
Cook JR. Letters to S Kimberly Belshe. Tobacco Education and Research Oversight Committee, 2 April 1997, 11 Feb 1997..
Haddad BA. Letter to Lisa Bailey, Gordon L Fund, and Mark Pertschuk. Governor’s Office, 16 May 1997..
Belshe SK. Letter to Jennie Cook. Tobacco Education and Research Oversight Committee, 19 March 1997..
Tobacco Education and Research Oversight Committee. Meeting notes (observation by Edith Balbach). Sacramento, California: State of California Department of Health Services, 25 March 1997..
(1997) Smoking by adults increases. Sacramento (California) Bee. (1997) More Californians are lighting up. San Francisco Chronicle, Mar 26:A1..
(1997) Adult smoking rises sharply in California. Los Angeles Times, Mar 26:A1..
(1998) Response to questions for October 16th hearing. (asher & partners, Los Angeles). (1997) The political realities of statewide smoking legislation. Tobacco Control 6:41–54. (1997) The defeat of Philip Morris’ “California Uniform Tobacco Control Act”. Am J Public Health 87:1989–1996. (1984) Social marketing of health behavior. in Marketing health behavior : principles, techniques, and applications. eds Frederiksen L, Solomon LJ, Brehony KA (Plenum, New York). (1990) Propaganda, puffing and the public interest. Public Relations Review 16:39–54. Aguinaga S, Glantz S. Tobacco control in Arizona, 1973–1997. Institute for Health Policy Studies, University of California at San Francisco, October 1997..
Scott S. Interview with Edith Balbach, 18 September 1996..
(1995) The use of public records acts to interfere with tobacco control. Tobacco Control 1995:222–230.